Are you in need of Urgent Care Cleaning tips? Cleaning an Urgent Care center requires a consistent approach. Cleaning techniques with healthfulness at the forefront is critical. The very nature of high volume foot traffic is a consideration. Furthermore, sick patients translate to more complexity. When patients enter, they should observe a clean space. Sanitized bathrooms are a must. Clean treatment rooms are non-optional. The list goes on! Urgent Care cleaning is a weighty responsibility. A clean space is a healthier space. Of course, a healthy space is important not just for patients, but also staff and visitors. 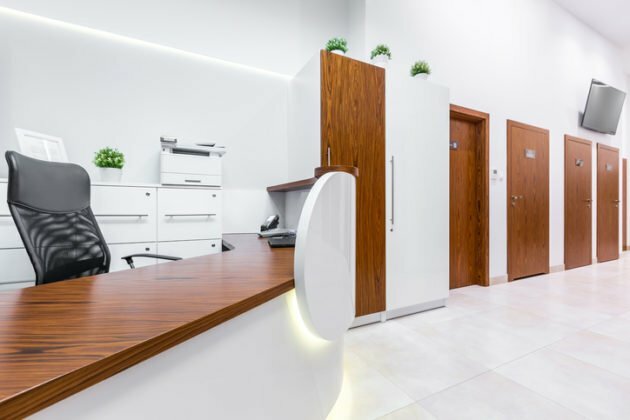 If you manage an Urgent Care center, this article will offer tips on what you might expect from your cleaning company. Review patient traffic, hours of operation, and size of your Urgent Care building to determine cleaning shift quantity. Touch points should be disinfected during each cleaning. Ensure floor cleaning includes an appropriate disinfectant solution. Discuss whether terminal cleanings should be handled by clinic staff or the janitorial provider. Do your bathrooms require cleaning more than once in a business day? Furthermore, what happens for clean emergencies? Is the cleaning company staff trained and certified in bloodborne pathogen safety? Remember that entrance glass and internal partition glass cleanliness has an immediate impact on clean perception. Does your cleaning company provide only standard janitorial services? Or, can they also deliver your window cleaning, floor maintenance, and carpet cleaning needs? Furthermore, can this be built for you in a single contract program? Finally, be sure to relay previous experiences with your janitorial provider. What facets of your cleaning program has worked well in the past? What areas for improvement have you noted? How poised is the cleaning company to modify your custom cleaning program when needed? What level of experience does the cleaning company have in a Medical Office environment? Always ensure a primary and secondary contact both for your Urgent Care center and with the janitorial provider. What is the definition of an emergency issue? What is the expected response time for an urgent issue? Formally, how should you initiate communication? E-mail? Client portal? Direct call? Text? Is it your expectation that any of your staff members have the ability to engage your cleaning company? How often should you have formal walk-through’s and conversations? Also, who should be present? These Urgent Care Cleaning tips should offer a strong foundation for ensuring your center stays consistently clean. The relationship you build and maintain with your janitorial provider is of the utmost importance! Foreman Pro Cleaning is an experienced medical office cleaning company. If you are in need of urgent care cleaning, or any other type of cleaning in a medical office setting setting visit our Contact Us page today! Additionally, you can call us right away at 888-360-1608. Previous Post Trusted Janitorial Services – Hampton Roads Virginia! Next Post Office Deep Cleanings – How Important Are They?